The Theta Tau Alumni Hall of Fame was established in 1986 to honor members who have excelled within their professions and/or this Fraternity. The first members inducted were the Founders of Theta Tau: Erich J. Schrader, William M. Lewis, Elwin L. Vinal and Isaac B. Hanks. Since then, just over 100 other alumni have been so honored. Mere nomination is itself a high honor. 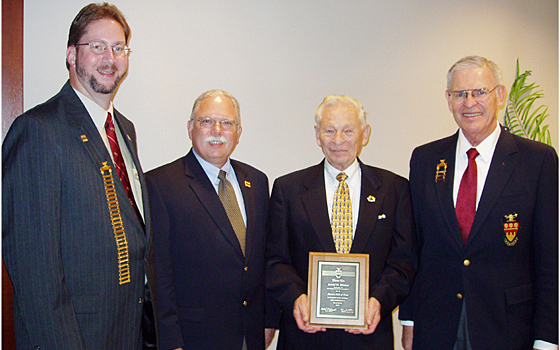 Chapters, alumni associations, and the Executive Council may each nominate one or two for this honor each year. Nominations must be sent to the Director of the Alumni Hall of Fame. Those nominated may be living or deceased, from your own chapter or another chapter of the Fraternity, nominated for service to Theta Tau or to their profession (engineering or something else). There may be a maximum of five inductees each year. Alumni previously nominated will remain eligible for five years from the date of their initial nomination. Remember alumni who built the Fraternity and chapter from which you benefit today. Help to make one or two deserving alumni feel a continuing part of Theta Tau through your nomination(s). This Nomination Packet includes instructions, forms, and those still eligible from past years.